Platinum is one of the rarest, purist and most precious metals. It is part of what is known as the platinum group, referring to elements arranged together on the periodic table, which includes indium, osmium, palladium, platinum, rhodium, and ruthenium. Its key properties are that it has the same sheen as silver, but does not tarnish, plus it is much harder and stronger than gold, making it useful for metallic bonding, and has an extremely high melting point. Platinum was discovered in the 16th century by the Spanish, who found it mixed with gold and called it “platina,” or little silver. 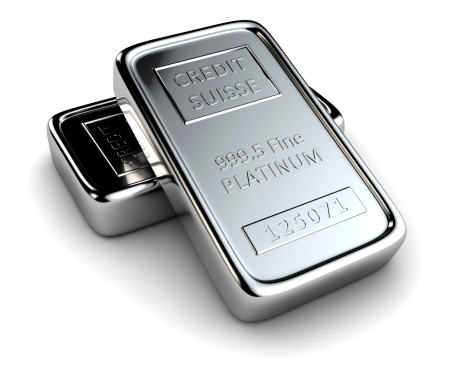 Most of the world’s platinum today comes from two countries – Russia and South Africa. In the early 1700s metallurgists in Europe began exploring its use in industry, but they were stymied by the great difficulty of melting the metal. Then, in 1782 new ways to melt the metal were discovered, and it began to be used by artisans. 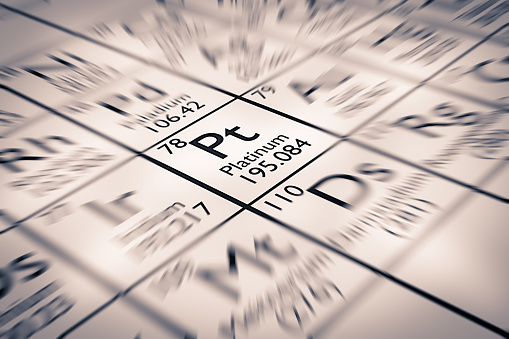 In the 1800s scientists discovered that platinum is related to the other four metals of what we now call the platinum group. These very rare metals are sometimes combined with each other to create special hard alloys. Platinum’s main usage has historically been for jewelry, where it is favored over softer metals, because its resists nicks and scratches. It also has often been considered better than gold, because it is rarer than the yellow metal, although, in the current market it is valued at a considerable discount to gold. Platinum also has many industrial uses such as in electrical contacts and components used in cell phones, computers, and other products. It is today primarily used for catalytic converters in automobiles, which has been a major source of demand for platinum. This is because the metal’s unique catalytic properties make it perfect for use as an auto catalyst, which converts the fumes from cars into carbon dioxide and water vapor. It is also used in medicine, dentistry, and to purify hydrogen gas and ground water. As far as coinage, platinum has almost never been used for circulating coins, apart from some pattern pieces from the U.S. Mint and other mints as well as coins issued by Russia from 1828 to 1845, but it was difficult to strike and hard to distinguish from silver. However, beginning in in the late 1970s, the metal began to be used for commemorative and bullion coinage, starting in 1978 in the USSR, and in the late 1980s by Australia, Canada, and other countries. The first major platinum bullion series were the Australian Koala, which began in 1987; the Chinese Panda, which debuted in 1987; and Canada’s Maple Leaf in 1988. As those foreign platinum coins grew in popularity, calls began to grow from the public and financial investors in issuing U.S. Mint platinum coins. This eventually led Rep. Mike Castle of Delaware (best-known as the father of the State quarter program) to develop legislation authorizing the issuance of U.S. platinum bullion and proof coins. The Platinum Eagle Series, which was also developed with input from the numismatic and precious metal community, was authorized with a 1996 law (Public Law 104-208). The proof version of the American Platinum Eagle was issued in June 1997, and the bullion version came out in September of that year. In the years since, all bullion coins have retained the John Mercanti obverse and Thomas Rogers reverse. The series has been issued through 2008 in four sizes (10th oz., ¼ oz. ½ oz. and 1 oz. ), and then only in the 1 oz. format since 2014. The proof versions, which similarly were struck in the same four sizes until 2008 before switching to soley the 1 oz. size in 2014, has always featured a different design on the reverse of each annual issue. The proof coins, since 2003, have been issued on patriotic themes related to the U.S. government and our democratic institutions and values. The current series for 2018-2020 is a three-coin set on life, liberty and the pursuit of happiness, core values from the Preamble to the Declaration of Independence and features a different design on each obverse that was created by Justin Kunz, while sharing a common reverse depicting a flying American eagle designed by Patricia Morris. At the end of January, the Mint released the 2019-W Liberty proof coin which is now able to pre-order. It features a stunning obverse with a design of Lady Liberty standing, wearing a wreath crown and holding a flaming torch in her right hand and a book in her left hand. The flame represents the guiding light of liberty, while the book represents the rule of law. The coin has a maximum mintage of 15,000 pieces. The 2019 bullion American Platinum Eagle was also released to its authorized distributors on January 7. As happened with several recent coins in the series, it is selling very well, having sold 27,100 coins as of January 31. The Mint plans to produce a maximum of 40,000 coins this year, 10,000 more than last year, according to a Feb. 18 Coin World article. There are other, recent platinum coins available now. These include the bullion version of the Royal Mint’s Britannia coin and various designs of the Queen’s Beasts series struck in platinum as well as the Perth Mint’s platinum Kangaroo coin. Each of these piece sells for a small premium over their melt value. There are at least three key benefits to purchasing and collecting platinum coins. The first is that they offer a good way to diversify your precious metal and coin holdings so that your portfolio is not overly exposed to fluctuations in the value of any one metal. For this specific purpose buying low-premium bars made of platinum such as those made by PAMP and Valcambi are also useful. The second benefit is platinum is currently, as of February 2019, selling for a spot price in the low-$800’s that the majority of precious metal analysts and experts consider to be an excellent value. Platinum is a metal that is popular with speculators, which is why its price has fluctuated so much. For example, in early 2008 it reached as high as $2,200 an ounce, but towards the end of that year when the economic crisis began, it came down to about its current level of $800. 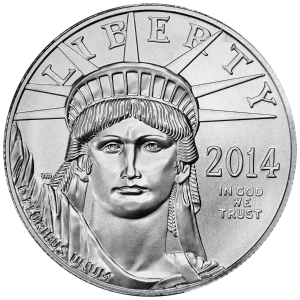 The third reason to buy platinum coins is that many of them have low mintages, especially the proof American Platinum Eagle coins like the new 2019-W release. In fact, some of the lowest mintage modern U.S. coins ever issued are from this series, including the 2015-W proof coin and the three fractional (i.e., less than one oz) platinum burnished uncirculated coins issued in 2008. 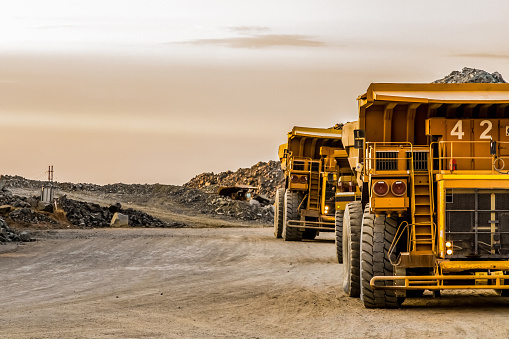 The demand for platinum, according to the World Platinum Investment Council, is robust and diverse, coming from industrial, automotive, jewelry, and investment demand. Demand for platinum bars and coins was strong in 2018. Its discount not only to gold, but currently also to palladium and rhodium, is expected to support an increase in demand this year of 2.4%. For all these reasons now is great time to add platinum coins to your collection.